With the 30-watt Blues Cube Hot, guitarists can tap into Roland’s acclaimed Tube Logic tone in the most compact Blues Cube combo amp. It is ready to be carried from home out to studios and stages. 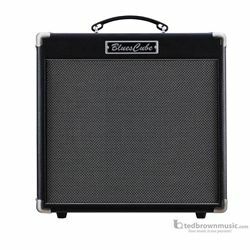 It offers reduced size, weight, and functions but is still equipped with a 12 inch custom speaker with the powerful and rich tube tone of the Blues Cube. Going far beyond modeling, Roland’s Tube Logic design philosophy starts with carefully reproducing the inner workings of the revered tweed era tube amp in every way, from guitar input to speaker output. Road tested and fine tuned with feedback from top players, the gig-ready Blues Cube delivers the sweet, magical tone and satisfying feel that makes a great guitar amp a highly expressive musical instrument.